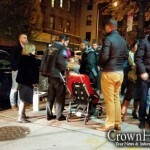 The second incident occurred in the intersection of Brooklyn Avenue and Empire Boulevard, the victim a young Jewish boy, was riding a scooter across the street, when a car attempted to make a right turn onto Empire and struck the boy. Thankfully, the child was wearing a helmet and though he was bruised up, he did not sustain any serious injuries. The boy was treated by Hatzalah and transported to an area hospital and was released back home a short while later. 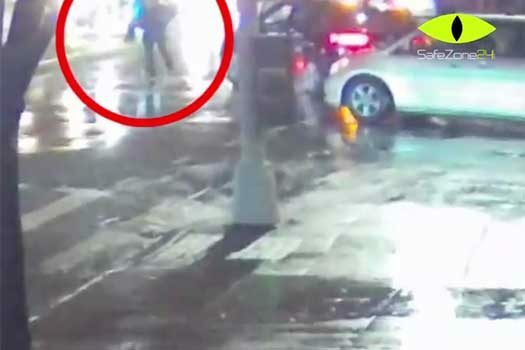 Authorities noted that the weather conditions at the time were extremely poor and the driver would have had a tough time seeing any pedestrians. Surveillance video of the crash [see below] revealed that following the incident the driver acted in a very careless and irresponsible manner – lifting the child up and walking around with him in his arms – “this could have exacerbated a spinal injury or worse” said a source in the medical field. “These incidents that both happened on the same day should serve as a warning to pedestrians, and even more so to drivers about the dangers the roads pose” said a witness. The public is asked to continue saying Tehillim for Schneur Zalman Ovadia ben Rina Miriam, who is still in critical condition and in intensive care. Just prior to the accident the passing car license plate was captured with an amazing clear night shot. This camera technology should play a role in creating a deterrent for drivers to drive safe and increase alert while behind the wheel and it also applies to hit and run incidents having their car plate detected. Are we still teaching our children to “Cross at the green, now in between” . Also, do they know what the white walk sign means? Time for some re education. There are definitely bad drivers out there but I had many close calls myself when I lived there .Kids too young to be out and crossing alone are in constant danger especially in the rain or when it’s dark..
Parents, don’t assume your kids are careful, walk them or keep them home. Where I live now even 13 year olds never walk alone. Glad he was weave a helmet and is ok.
Traffic in Brooklyn is insane! There are too many cars; it takes too long to go from one place to another; there is not enough room to support a reasonable flow; the so-called traffic improvements have done nothing to aid the situation. Ever tried driving down a street where there is consistent double or triple parking on both sides??? ?Then, there is, of course, the pious Jewish drivers honking Jewish women pushing strollers because they are using the cross walk at the appropriate time and blocking them from driving around like madmen.